Tahnee Welch plays an ethereal alien in Twentieth Century Fox’s 1985 hit sci-fi adventure, Cocoon. How much did this movie reflect the Venusians and other ETs’ affinity for aquatic activities and environments? As a direct result of the peaceful Venusian encounters previously investigated by Kenneth and Doris Arnold, and as reported in this website, these two intrepid UFO and paranormal researchers were coming to some amazing conclusions about the Venusian presence here on Earth. In my 2017 London Book Festival award-winning book, Final Countdown: Rockets to Venus (Terra Alta, West Virginia: Headline Books), I devote eight pages to the Arnolds, and continue to dig up yet more startling revelations from their files about their own sightings, their research and the evolution of a cosmic consciousness which surely ensued. In Timothy Green Beckley’s UFO Review, Number 14, 1982, published in New York City, Arnold detailed some of his evolving views on UFOs and their crews. Beckley, a.k.a. “Dr. UFO,” had dispatched an investigative journalist out to the Arnolds’ home in Idaho to get the skinny from Arnold himself about what he had learned as to the nature of the enigmatic flying saucers over the years following his famous encounter with nine disc-shaped objects flying in formation over Mt. Rainier in the Cascades in 1947. At the time of the interview, the Arnolds were living in Meridian, Idaho. While the civilian pilot’s ideas about the nature of the flying saucer phenomenon were changing, he still believed that they were real objects. There was nothing imaginary about them. “It was no optical illusion,” Kenneth Arnold insisted. “So please explain this concept of UFOs as living life forms,” requested the reporter. “Definitely, I agree with you, Mr. Arnold. I think an eternity like that would be boring, and pointless, really,” replied the UFO Review journalist. 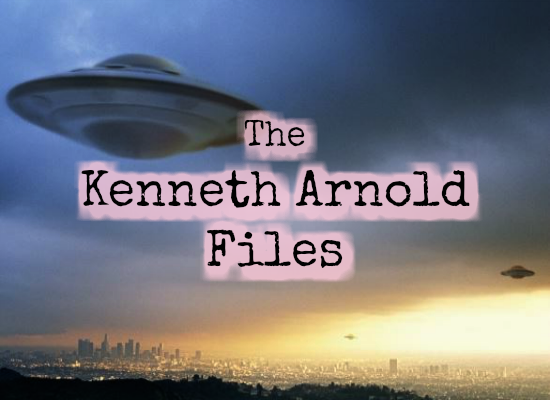 Kenneth Arnold’s thoughts on UFOs were surely evolving. His speculations about the flying saucers and the beings who piloted them was beginning to find parallels in the works of the famous French ufologist and computer specialist, Jacques Vallee, in addition to those of the American Fortean researcher John A. Keel, both of whom were advancing a similar view about these type of phenomena being largely associated with inter-dimensional intrusions into our reality, our space-time continuum, as it were. Omnec Onec will also be one of the many experts, along with the “Cosmic Ray” Keller, talking about the advanced civilizations on Venus and what the Venusians have to teach us at this year’s Mt. Shasta summer conference. Omnec Onec, the “Woman from Venus,” brings a message of hope and love to all the inhabitants of the Earth. The Venusians arriving here on Earth come in peace for all humankind. They are bringing us celestial knowledge and illumination in order that we may lift up our planet, preparing our brothers and sisters for the work ahead in building a paradise sphere worthy for acceptance into the Galactic Federation of Light. This cosmic organization currently consists of 51 planets in an enduring alliance. All is not work for our brother and sister Venusians. Even while here on Earth, carrying out their important missions, they take time for activities of personal enrichment and recreation. They certainly believe in continuing education; and they make time to incorporate such activities conducive to this end into their busy schedules. Photograph of contactee authority, Frank Chille, who shares information on Albert Coe’s June 1920 encounter with a Venusian fisherman up in the woods of Ontario, Canada. Frank and the “Cosmic Ray” Dr. Raymond Keller will be speakers at this summer’s Mt. Shasta conference, 27-29 July, titled “From Venus with Love,” and sponsored by Rob Potter of the Promise Revealed. As Coe made his way down the gorge in response to the cries of distress, he found a seemingly young man who had apparently fallen into a deep cleft in the rock, getting himself stuck in the process. After freeing him and trending to his wounds, Coe took note of the unusual silvery jumpsuit the man was wearing. He also saw that the man was equipped with an instrument panel strapped across his chest, on the exterior of the suit, and that this apparatus had been smashed in his fall. Coe inquired as to what the man was doing in such a remote area and was told that he had flown into the area with his “plane,” that he had landed in a nearby clearing. He explained that he was looking for a good place to some fishing. That he was flying an airplane in itself would be quite remarkable for the year 1920, when such aircraft were just becoming popular attractions at barnstorming aerial performances. In any event, Coe stayed with the man to help him look for his missing fishing road and tackle box. Upon finding the “fishing rod” for the mysterious pilot, Coe noticed that it was highly unusual, exhibiting characteristics that he said were, “the likes of which I had never seen.” The rod was bright blue and the fishing line came directly out of the tip. Of course, the pilot was extremely grateful for Coe’s kind assistance, both in saving his life and recovering the mysterious fishing rod. The stranger asked Coe for his name and address, for he would “surely write him” at the earliest opportunity. Coe insisted on helping the man get back to his airplane. As this was 1920, the term “flying saucer” had not yet entered into our vocabulary. But after 24 June 1947 when fire fighting-equipment salesman and private pilot Kenneth Arnold reported nine disc-shaped objects flying in formation at a speed of 1,200 miles per hour, like “saucers skipping across water,” Coe would refer to the object he observed with this new appellation. The flying saucer observed by Coe, he would later learn, was a Venusian scout craft. It was quite similar to those sighted by George Adamski and other contactees nearly three decades later. Before Coe left the area to rendezvous with Rob, albeit late, he learned that his new friend, Zret, was a tourist on Earth from the planet Venus. Zret did write to Coe, as he promised; and they met secretly at many places throughout Coe’s life. Coe also encountered many other Venusians and came to discover much about their customs, languages and social mores. Venusians were particularly fond of water sports and activities insofar as they came from largely underground cities situated in played out lava caves in the vicinity of vast aquifers. Most of the surface of Venus was quite arid, except in the mountainous areas where his ancestors, that migrated to Venus from the planet Norca in the Tau Ceti system millions of years ago, had come to settle. They had to leave the world of Norca because of extensive desertification. Now it seems that a nudist beach in Wales is catching the eyes of Venusian tourists, according to expert paranormal investigators from the Mutual UFO Network (MUFON) in the United Kingdom. Many visitors to the Morfa Dyffryn beach, situated between the Welsh towns of Harlech and Barmouth, reported a series of strange objects hovering overhead. Among the phenomena are a pure orb-like object and another spherical craft of some sort surrounded by rings. As news of these sightings spread, MUFON investigators began arriving in hoards at the beach, scaring and chasing away the regular nudist crowd, in addition to any Venusians that may have infiltrated their ranks. MUFON is a designated non-profit research group in the United States. The organization’s investigators have taken it upon themselves, however, to mark off the beach as a “place of interest for extraterrestrial activity.” The regular nudists at the beach, however, do not appreciate the spotlight that this has placed on their once secluded and comfortable beach. MUFON field investigators have badgered visitors at the Morfa Dyffryn beach to report any sightings even strange sounds to their local chapter, and especially to “take photographs,” even if they include Welsh men and women frolicking in the buff. The MUFON notice declares that, “A number of unexplainable sightings have been reported in this area, day and night. Strange lights, plasma balls and other apparitions have been reported. These occurrences have been noted in areas out to sea, the beaches and within the sand dunes.” While MUFON says the photographs and other evidence collected will only be “used in the scientific study of these events,” the beach goers have their doubts. Yet another claimed to have sighted a UFO at the beach. “It had five to six glowing rings and was slowly moving in a circle. From the side, it had some lights,” noted the observer. Andy Sayle, the chief executive officer of LIS Aerial Photography, isn’t convinced. He first spotted the MUFON sign while flying kites with his children on the beach, just a short distance away from the cordoned-off nudist area. He thought that there might be a more reasonable explanation for the sightings than alien intervention. Despite the alarmist attitude of the MUFON field investigators, there is nothing to fear of the Venusians presence here on Earth. They come in peace and mean us no harm. Because Venus is the closest planet to the Earth, just 26,000,000 miles at its closest approach, our world, with its great biodiversity and oceanic environments, is the prime location for Venusian tourism. Anyone who remembers a teacher who took care to organize her or his students on a field trip can readily appreciate this sentiment from the great teacher of the mystic arts from the Royal Order of Tibet, George Adamski.